Many civilizations throughout history have relied on green tea as an energy source and health supplement. Green tea extract is a highly concentrated source of the tea, particularly its antioxidants, which can help prevent serious illnesses such as cancer. These antioxidants fight against free radicals (unstable atoms that cause cellular damage), a common cause of cancer and other serious health conditions (x). Green tea is also an effective weight loss aid (x). If you don’t like drinking green tea, you can reap all the same benefits by taking green tea extract. Green tea contains highly concentrated levels of antioxidants, which fight free radicals and protect your body from disease. In particular, green tea extract is rich in polyphenol antioxidants, or catechins, which have been known to increase the body’s antioxidant levels (x). Because green tea has such strong anti-inflammatory properties, it may relieve symptoms of a variety of inflammatory diseases, such as Crohn’s disease (x). By reducing inflammation in the muscles and connective tissues, green tea extract may also help ease general chronic pain. Hailed as fat burner, green tea extract can assist with weight loss. Both caffeine and catechins regulate hormones in your body that cause thermogenesis, the process of turning calories into energy (x). Caffeine and catechins could make losing weight easier when paired with a healthy diet and exercise regimen. Green tea extract also has proven dermatological benefits. When applied topically, green tea extract can treat a number of common skin conditions, including acne, rosacea, alopecia, warts and others (x). It may improve signs of aging caused by sun damage (x). Green tea may improve your cardiovascular health by reducing your blood pressure (x). It also helps reduce inflammation and cholesterol buildups in the bloodstream, preventing cardiovascular illnesses(x). Green tea may also improve your body’s ability to tolerate blood sugar, in addition to regulating insulin activity (x). Diabetic and pre-diabetic patients may notice improvements in their symptoms after taking green tea supplements. However, if you are diabetic patients, you should always talk to your doctor before taking a new supplement. Green tea extract may protect the brain from neurological conditions, such as Alzheimer’s and Parkinson’s (x). It has also been shown to help improve brain function by supporting memory and task performance (x). During workouts, your muscle cells undergo damage, which makes them feel tired and sore. But green tea may help: a study published in the journal Physiology and Behavior in 2018 found that green tea reduced markers of cellular damage in muscles after workouts (x). When consumed routinely, green tea may even improve exercise performance. The anti-inflammatory properties of green tea extract may also benefit your liver. Green tea has been shown to reduce levels of the enzymes alanine aminotransferase (ALT) and aspartate aminotransferase (AST) (x). Elevated levels of ALT and AST usually indicate inflammatory liver diseases. However, the European Food Safety Authority has reported that excessive amounts of green tea may harm the liver, so it’s important to stick to the recommended dose when taking a green tea supplement (x). A cardinal benefit of antioxidants is that they help your body fight off free radicals, which may cause cancer. Studies suggest green tea extract may prevent many different types of cancer, although more research is needed to prove its efficacy (x). If you come down with chronic colds, try adding green tea to your diet; it could boost your immune function to help your body fight off infection. A 2007 study published in the Journal of the American College of Nutrition could support immunity by improving the action of t-cells: important defense cells in your immune system that fight invaders and disease (x). This soothing beverage originated in China and has been valued for its medicinal properties for centuries. Camellia sinensis is the plant used to make green tea. Global production of green tea reached 5.07 million tons in 2013 (x). One serving of green tea contains only one calorie, making it a popular low-calorie alternative to other teas and drinks. As long as you adhere to the recommended dosage, green tea extract is safe to take for healthy adults. Some side effects are directly related to green tea’s caffeine content. It may cause stomach upset, vomiting or diarrhea. Other common caffeine side effects include headaches, sleeping troubles, increased nervousness or anxiety, heartburn and dizziness. Consumed in moderation, green tea extract benefits the liver, but consumed in large quantities, it can harm your liver. Talk to your doctor before taking green tea supplements if you have a history of liver problems. You should also talk to your doctor before taking this supplement if you are nursing or pregnant. 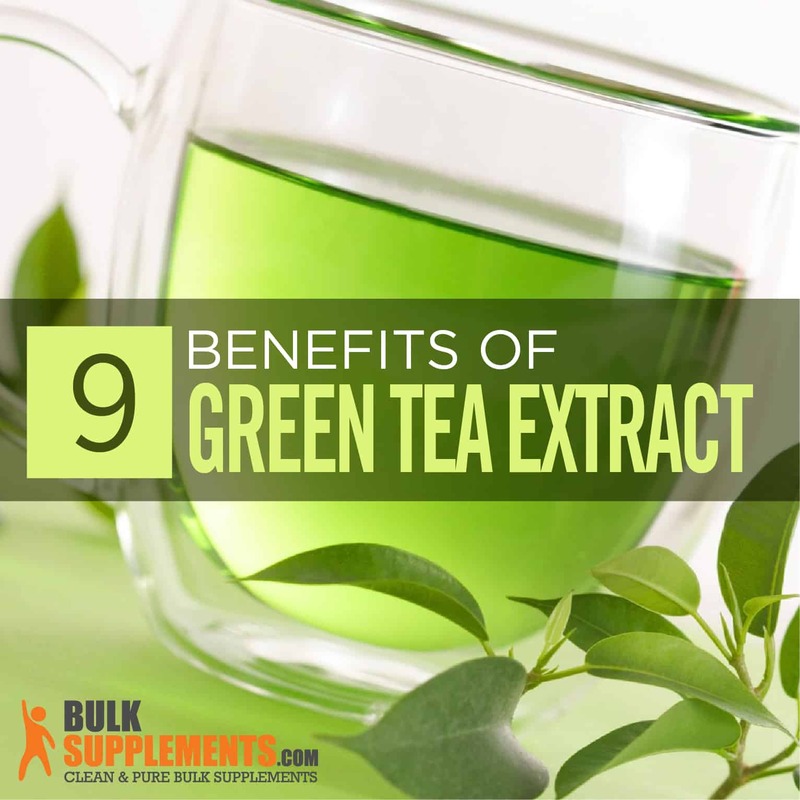 Besides drinking the tea itself, you can also reap green tea’s benefits in supplements. It’s available in pills, capsules, herbal blends and more. You can also take green tea extract powder, which contains a high concentration of beneficial compounds. As a dietary supplement, take 500 mg (roughly 3/16 tsp) once or twice daily. Never take more than 1,000 mg per day, and never for more than 3 months at a time. Green tea extract prevent several chronic conditions. Its antioxidants may help protect your body from free radicals that damage your cells, preventing cancer, neurological damage, heart disease and other serious health conditions in the process. Green tea may also effectively reduce inflammation and chronic pain, improve skin conditions and shorten exercise recovery times. Green tea has been praised as an herbal medicine for centuries. In fact, it boasts many antioxidants found in many fruit and vegetables. **These statements have not been evaluated by the FDA. Supplements are not intended to diagnose, treat, cure, or prevent diseases – instead, they help maintain your long-term health.